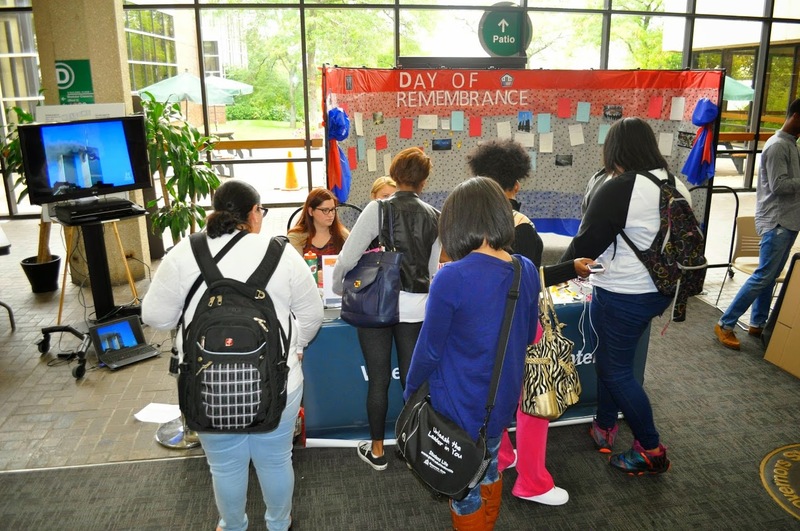 On October 18, the community service council and other GSU students came together to take a bus trip to attend Wright Junior College in order to help legal residents become U.S. citizens. The volunteers arrived at GSU promptly at 7:00 a.m that Saturday morning. Although it was rather early, the volunteers were fully awake and arrived fully prepared to work. The bus ride was about an hour long. Once we arrived at our destination, we gathered together to discuss with one of the hosts what to expect from the event. One of the hosts name was Marcelo and he passed out additional information in regards to the many ID cards that we will see. We also talked very frankly about the N-400 form, which is a form that each of the legal residents needed help to fill out.He also informed us that all the information that we received are all forms of legal documents that will be handled by lawyers as well. This information was needed so that nobody got overwhelmed. Once everyone was assigned a table, that is when the event really started. On the table, there was white out tape,two laminated signs that read copies on one and questions on the other. Another hosts called legal residents over to the table in order to get assistance on their forms. Looking at all the volunteers faces, one can tell that each of them really enjoyed meeting so many different people. Day of Remembrance, a day for us to remember and reflect on our true support to our homeland and thank those who serve in protecting it. 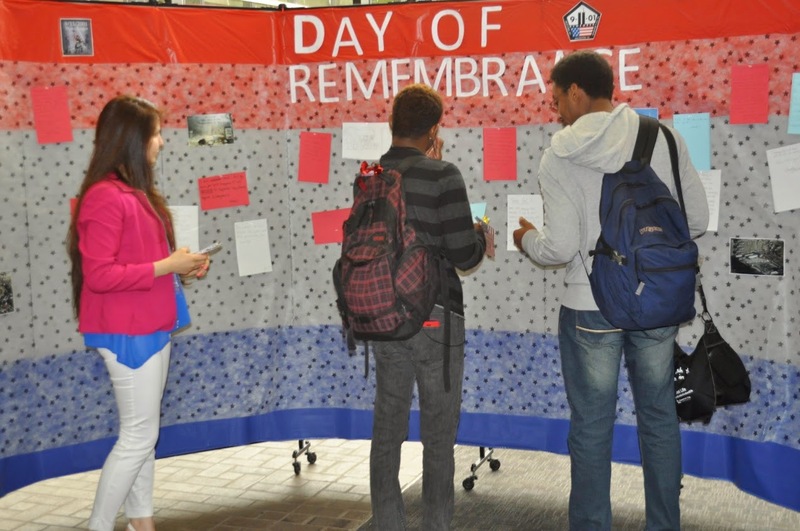 This day was held right here on our GSU campus. 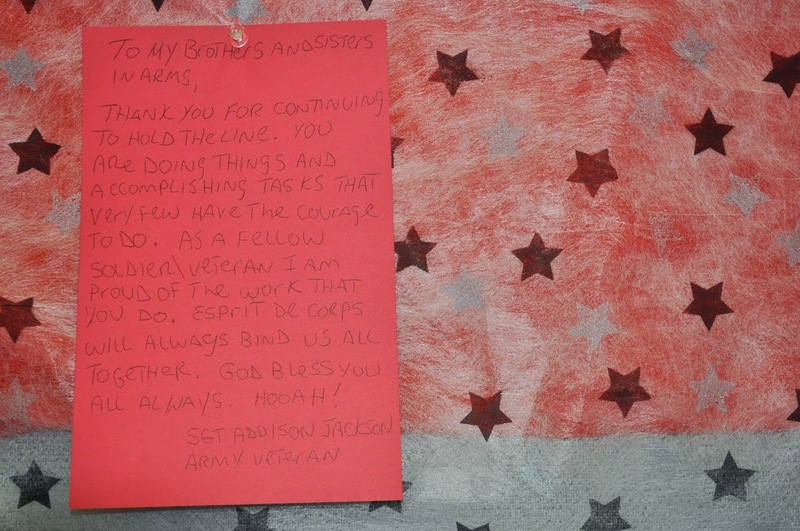 We had a collaboration with the Veterans Resource Center in executing this day. 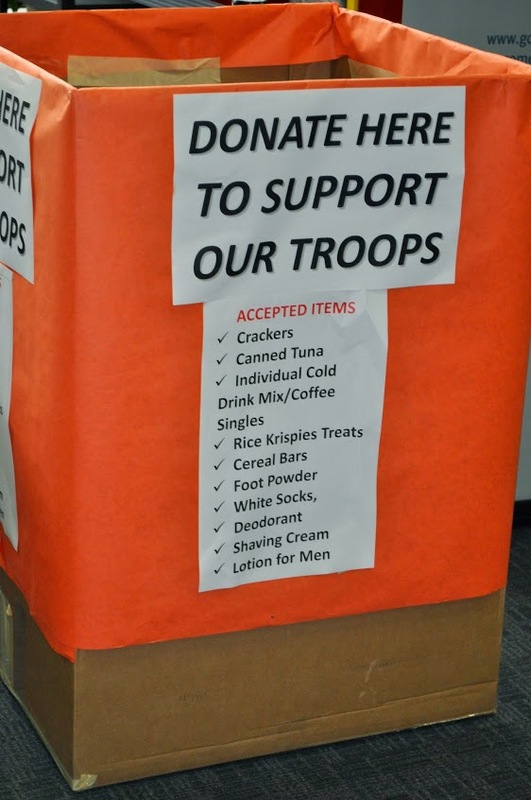 Donations collected were sent to Operation Support Our Troops to be shipped to our soldiers deployed overseas. Our event took place in the Hall of Governors. We had two tables set up for this event. 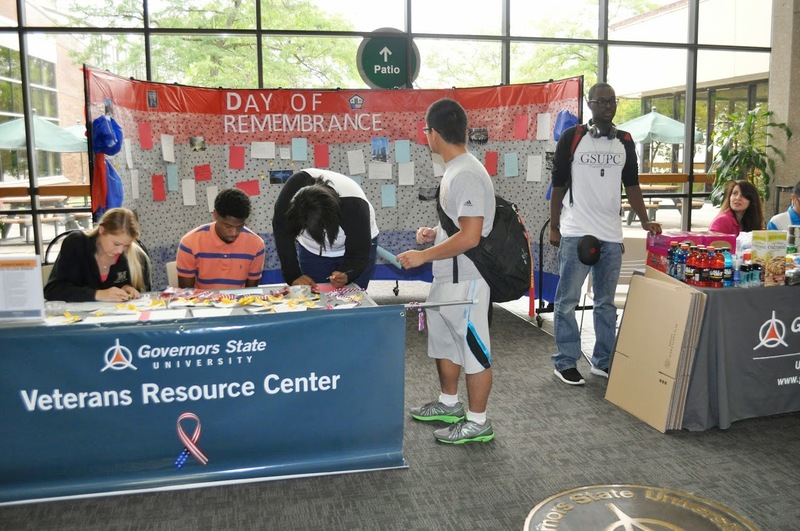 On one table we had the donated items and on the other table, there were yellow ribbons and flags that were passed on to people who were passing by or those who wrote a letter to our soldiers in service. We received many donations from faculty, staff and students. The donated items were boxed by our student volunteers right after our event. 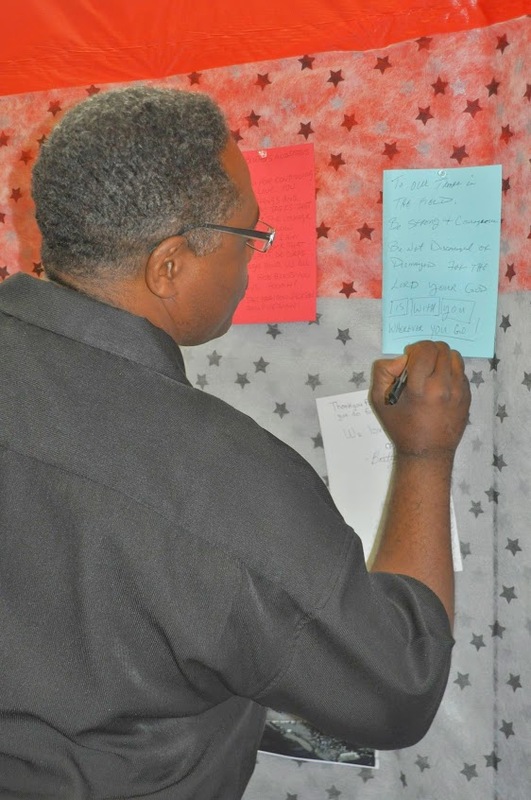 The day ended with many letter writings that were posted on the wall, all of which showed humble and sincere thanks to those who serve our county; others have also wrote a reflection on how they felt at the time back in 2001. On the beautiful early Saturday morning of August 30th our Civic Engagement and Community Service Center gathered our amazing students to serve in our very own University Park’s community farm. 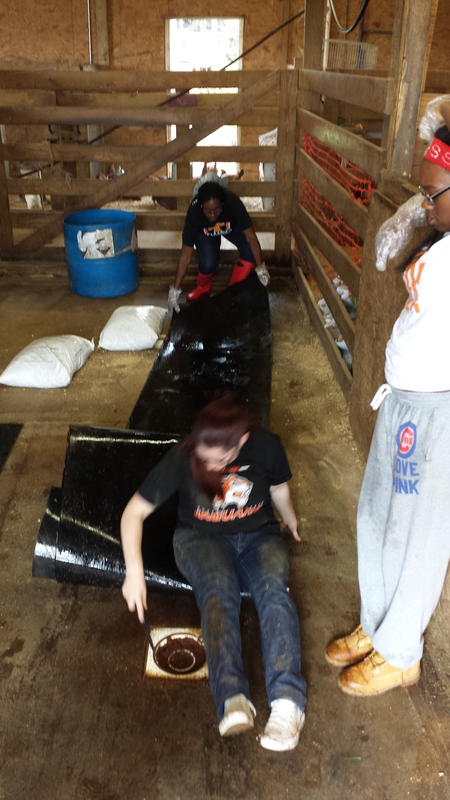 Our students were enthusiastic enough to drive to Riegel Farm and sweat themselves to help create a clean home for the animals. 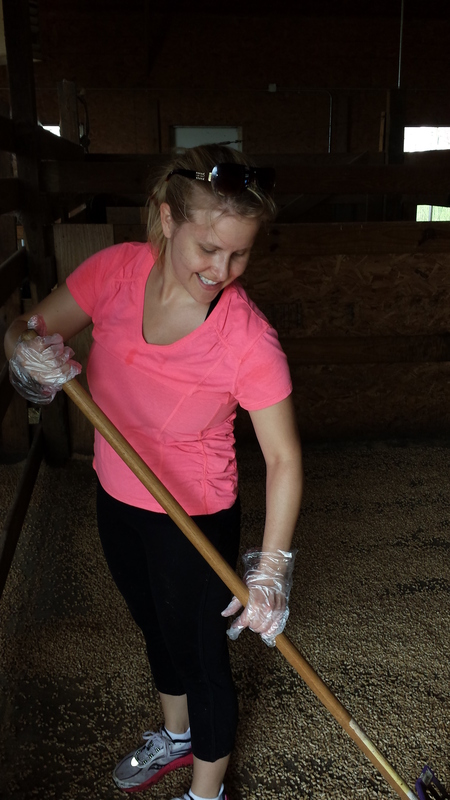 The purpose of our students going to the farm was to show support, connect and learn about one of our community partners. The farm has different interesting animals from pigs, rabbits, chickens, horses, sheep, goats, and llamas as well as more exotic animals like peacocks and alligators! There were stalls for each kind of animal which needed its own style of attention in the aspect of setting and food supply and cleaning process. 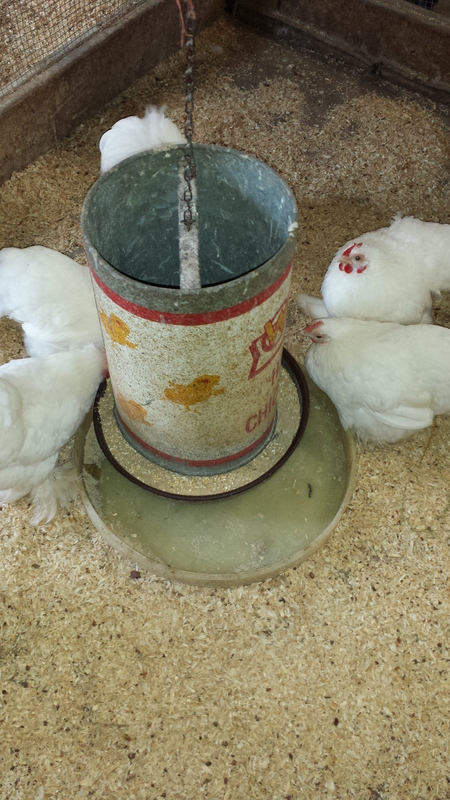 The cleaning of each stall is a weekly process that the farm owners perform given the kinds of animals. Having experienced it this day, it was easily understood that it is not an easy process and requires a lot of labor and many teamwork to complete this task. 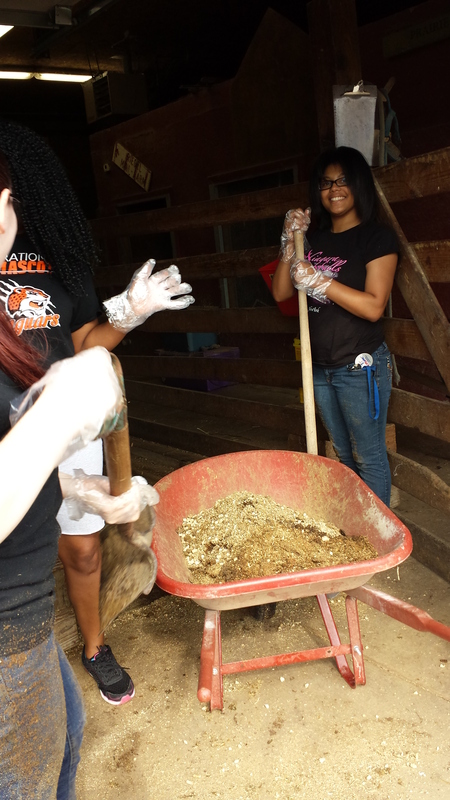 The process of cleaning started by scrubbing and sweeping each stall and ended with adding new shredding and Pine Pellets. 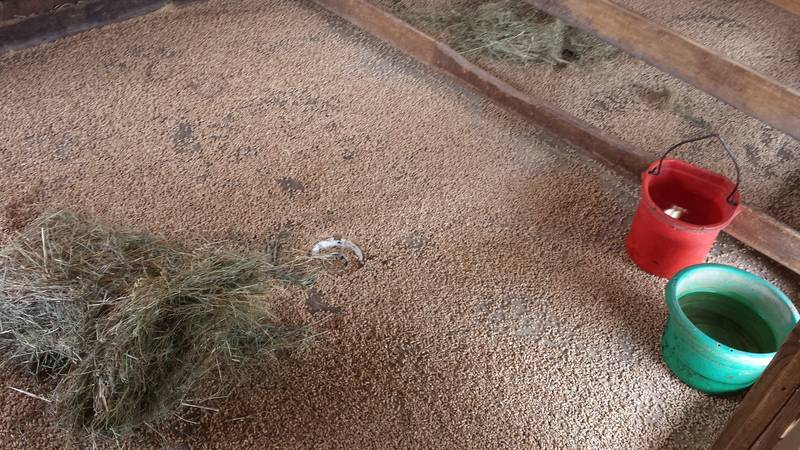 The cleaning process included washing and bleaching mats that were under old pellets. The mats under the pallets were of rubber material and with the length of each mat the heavier they were. It took a lot of effort to carry each of the mats and scrub what was under it and then carry the old pallets the dirt on them on a wheel barrel to be disposed. After all the cleaning that was done, water buckets were refreshed and inserted back to each of the stalls, and new food was also added to each of the stalls. 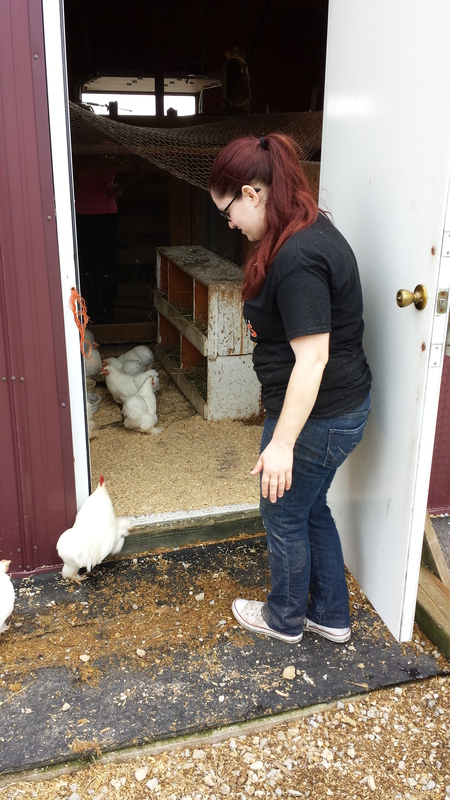 The exciting part of participating in this event is that the students were able to interact closely with the animals and learn about the needs of each of the animals and how to care for each of the animals. Asking the students to reflect on this service day has allowed us as community organizers to understand the interests of the students and how much they are willing to partake in activities as such. It is to understand that not every individual has the same interest as the other and so this volunteer opportunity has provided students with a chance to reevaluate their purpose of serving in their community. The Center for Civic Engagement teaches Blogging! It seems appropriate after presenting a workshop on Blogging for GSU’s FSI (Faculty Summer Institute), to write a blog post about the experience! I must admit I was nervous about the entire endeavor, I had prepared in the days before the event with a 20+ slide PowerPoint presentation. It was a format I thought would be familiar and comfortable for the folks I would be presenting to. The PowerPoint wasn’t particularly flashy, but it did have a lot of bullet points and information. The day before the presentation however, I became increasingly worried that I would simply be reading off of a PowerPoint (please never do this, generally your audience is just as capable of reading as you are) and boring folks with a long and non-interactive presentation. I was also struck by the irony of presenting on the merits of interaction as a learning technique while using one of the least interactive mediums possible. So, true to my neurotic and indecisive nature I ditched the PowerPoint at the last minute and started anew. Actually doing the PowerPoint gave me the advantage of being very comfortable with the material I was presenting on, which despite some evidence to the contrary was not a topic I felt I was an expert in, and allowed me a bit more freedom in choosing a new, hopefully more interactive workshop format. I ended up choosing to show the direct sources (webpages) of some of the information I had gathered. So, armed with a day of fervent research and a browser overflowing with tabs I went into the workshop somewhat more manic and loose than may have been appropriate. The workshop itself was, I think, benefited from this energy. The loose structure allowed people to ask questions they were interested in, and allowed us to discuss topics that were related to social media but weren’t strictly about blogging. Questions of privacy, millennials, and journalism all came up during the workshop. It was my hope that I was able to clearly express the many benefits of blogging while also giving the attendees enough tools to go out and create dynamic blogs. One of the more difficult things about presenting on blogging is the incredible diversity of platforms and mediums with which one can blog. So, I found myself relegated to explaining the different blogging platforms and recommending different platforms and medium based on an individuals interests. On a constructively level, I think perhaps the workshop would have benefited from slightly more structure (although I enjoyed the energy that was brought to the discussion as a result of its lack of structure) and a greater emphasis on the actual minutia of creating a blog (although, that is difficult to accomplish because, again, it varies by platform. I would be very interested to hear what other had to say! Participate in our poll, or leave a comment below! Freshly Uncovered! 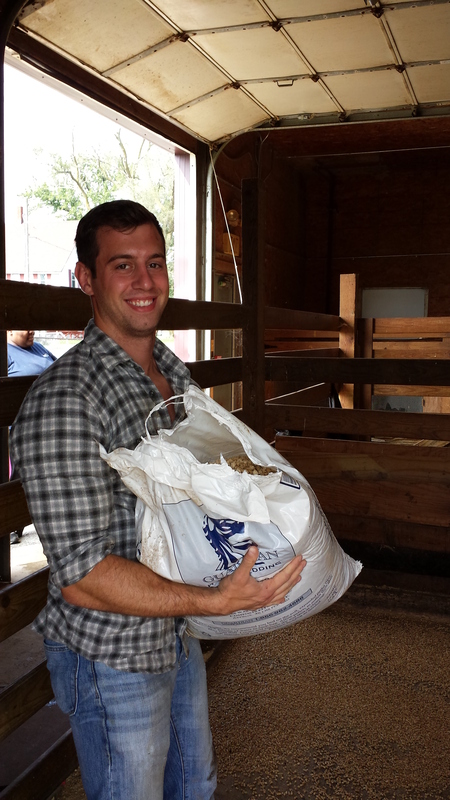 New trove of photos from GSU’s Rebuilding Together Service Day! GSU & Rebuilding Together Team Up to Restore a Home! If one was inclined to go for a walk through the sleepy village of Riverdale, Il on a beautiful Saturday morning in late April, they might have stumbled across a rather unusual sight in one of the village’s charming residential streets. On a block that would otherwise seem deserted at 8 A.M. on April 26th, save for the occasional dog barking in a backyard, or tired neighbor walking out to fetch a newspaper, there was quite a bit of commotion outside one particular home. If one had chosen to walk by this home they would have seen a team of GSU faculty, staff and student volunteers bright-eyed and eager to begin a day of rebuilding. GSU’s Center for Civic Engagement and Honors Program, led by the indomitable Dr. Tywanda Jiles, had teamed up with a wonderful non-profit organization called Rebuilding Together, to help restore and rebuild a home more suitable to its 92-year old owner, the widow of a World War I veteran, Mrs. Eva. Armed with cans of paint, drills, garden supplies, a carpenter who had volunteered his time, and a positive can-do attitude volunteers set to work on the myriad of tasks set for the day; Repainting two bedrooms, installing smoke and carbon monoxide detectors, replacing and weatherizing and outside window, installing grab-bars in the bathroom, changing out the door handles throughout the home (for ones easier for our homeowner, Mrs. Eva to use with her arthritis), installing energy-efficient CFL light bulbs, and revitalizing her front and back garden. No task was too small or too difficult for our volunteers, who thought only of ways they could make the house ‘safe, warm, and dry’ for our homeowner. Our day began at Ms. Eva’s home at 8:00 a.m. with the volunteer’s arrival; all clad in their Rebuilding Together t-shirts. There were 25 motivated people who came excited to meet Ms. Eva, who was a very welcoming and kind host to all the volunteers. The students’ tasks were divided before they reached the home based on their skills and interest. Given the size of the home, the tasks required, and the enthusiasm in our volunteers the whole house quickly felt very full of both people and energy. Volunteers set to work, placing cover sheets on the furniture and moving it. Every volunteer inside had either a paint brush or a paint roller. The volunteers that were outside had gardening tools and trash buckets ready to remodel the front garden. Volunteers seemed to enjoy the team-work aspect of their tasks; they were excited while exchanging chores and tools. It was a full productive day for the students. Ms. Eva was a very warm and personable home owner, offering coffee for all the volunteers. Volunteers had a greater opportunity to connect with her during the lunch break where she shared stories and told them more about herself. Having that personal connection to Mrs. Eva definitely made the work more rewarding for the students, who could directly see the impact they were making. The photos here are only a few of the hundreds of photos that were taken to share. After the day was complete, Dr. Jiles took care to specially thank all the volunteers for their efficiency and the quality of their work. Ms. Eva was given a tour of the house, seeing for the first time all the improvements that our volunteers had made. Her calm smile and words of appreciation made it clear just how pleased she was with all that had been done, and that was reward enough for our volunteers. 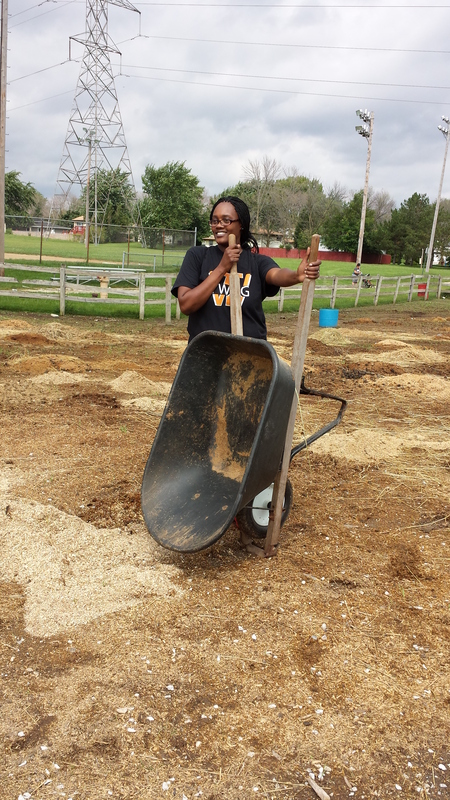 while outside volunteers were busy revitalizing a garden. 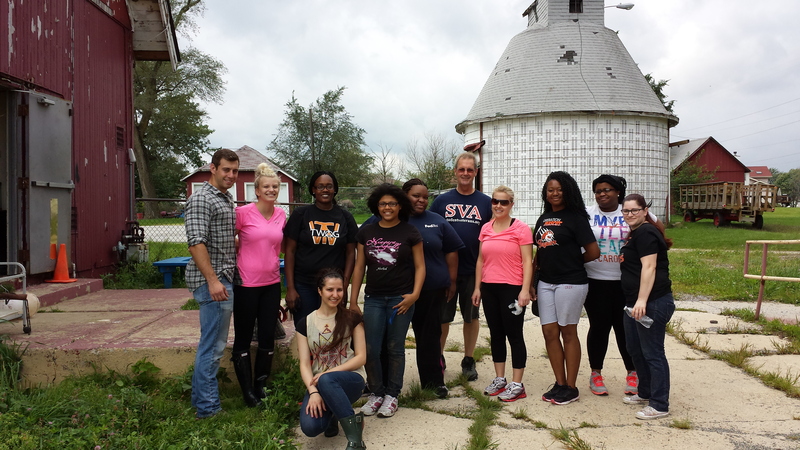 Mrs. Eva, Dr. Jiles, Dr. Rhea and some of our student volunteers. 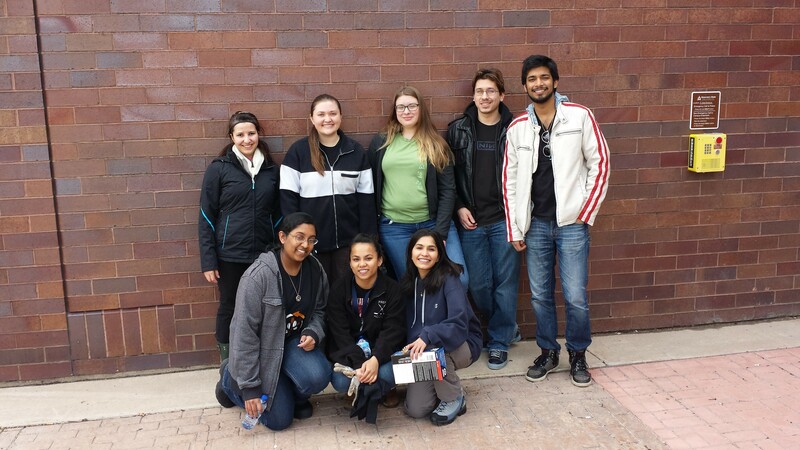 The Earth Day Service Project was created to protect the environment around Governors State University’s campus. Inspired by the Thorn Creek Woods Nature Preserve that lies just outside of GSU and our institution’s renewed commitment to sustainability, particularly through the adoption of a sustainability cohort for freshman in 2014, a number of students, faculty and staff took on the mission of removing waste from our campus. Volunteers arrived excited and energized at the prospect of working with like-minded individuals on a common goal. Our day began with volunteers signing-in and gathering together in student commons for lunch. We were pleasantly surprised at the number of volunteers who had not originally signed up, but wanted to join us regardless. We were particularly gratified to have such a turn out when the weather was less than ideal as it had snowed the night before, and much of the ground we planned on cleaning was still covered with snow. Volunteers were instructed on safety procedures, and what to expect on the grounds before we left campus. 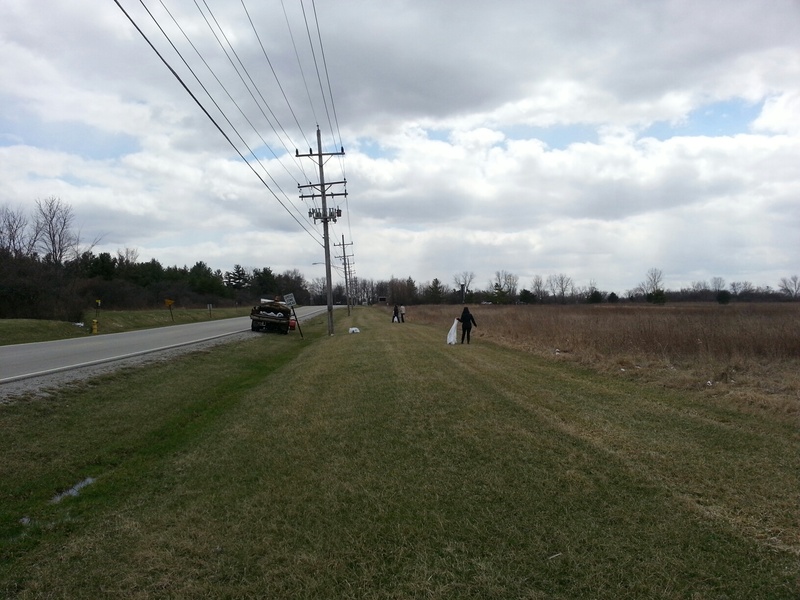 Our volunteers were then divided into groups of three, given gloves, 56- gallon trash bags and trash grabbers, and sent to their respective zones for the clean-up effort. 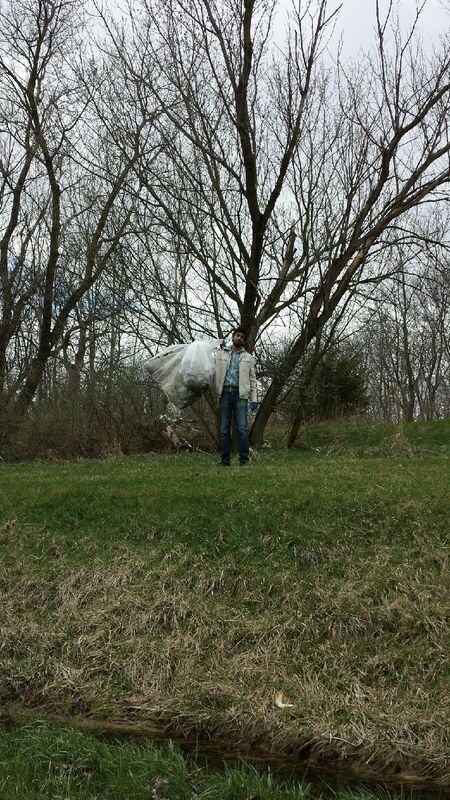 The day was one full trash bag after another being filled and carried to the dump trucks. 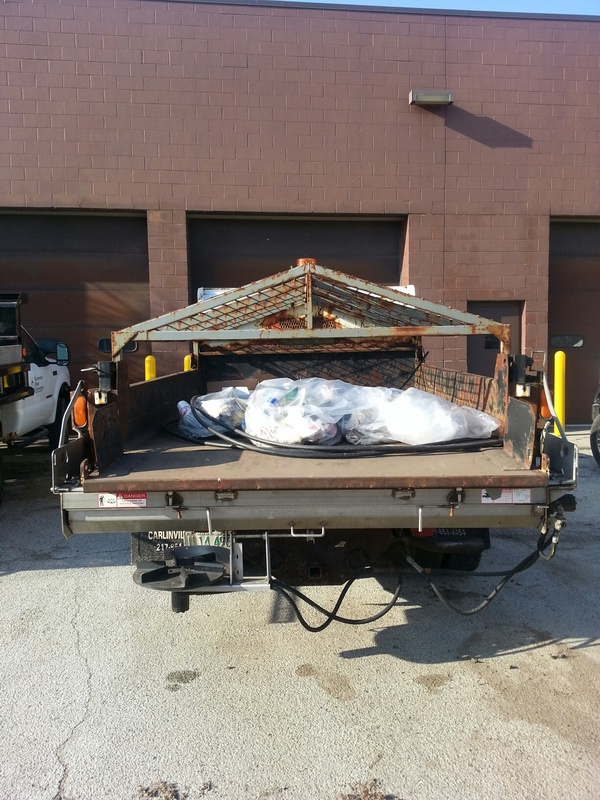 Some of the bags were heavy, weighted because of the sheer density of heavier trash like glass bottles, car bumpers, and even PVC piping, and required two people to carry. 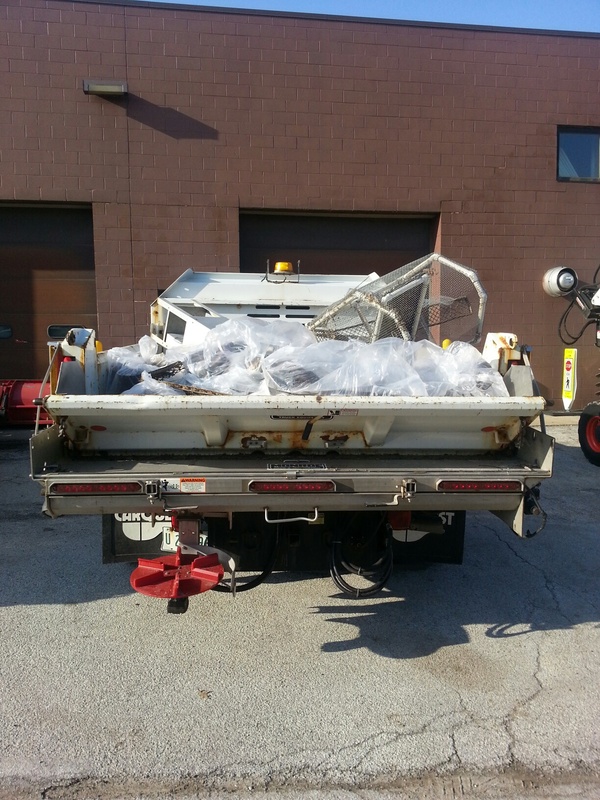 Many objects that were found required a lot of labor to remove, such as hubcaps, engine parts, fence hinges, rusted buckets, tires, and pole wires. 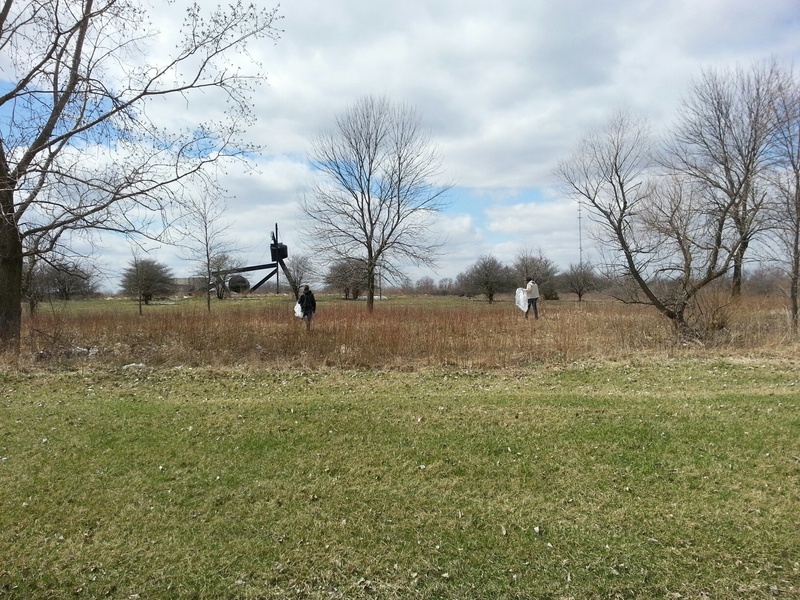 The group that went to the Field Station was able to pick up old abandoned laboratory experiments. Students seemed more energized and motivated every time they picked up something interesting. Many participants stumbled upon the same question: “How did this even get here?” Analyzing how old the materials looked, it was suggested that these were left behind by residents from the past decade, who were more likely farmers. 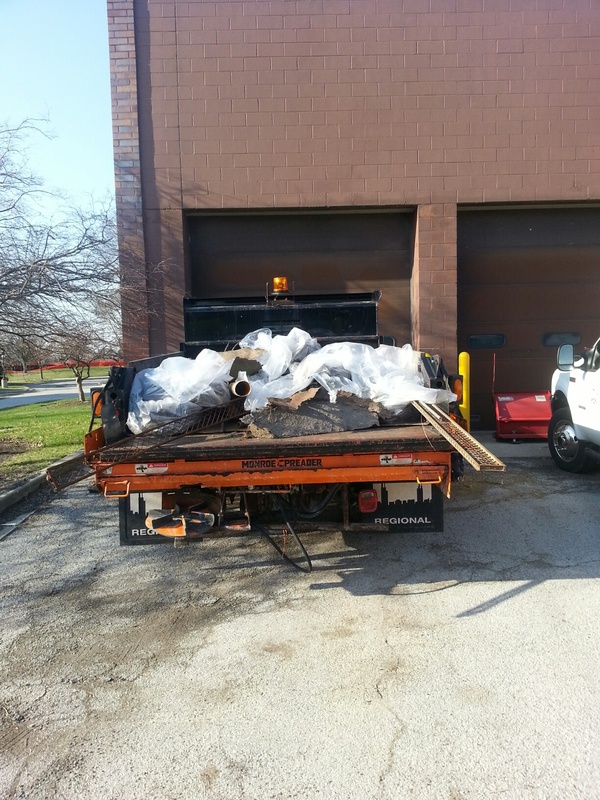 The day ended with the three dump trucks filled with trash bags and large items picked up off the grounds. Our mission was accomplished, although it felt like there was a lot more that needed to be done. After the event volunteers were seemed to have a greater sense of responsibility towards their own surroundings, as well as a greater respect for nature. The volunteers agreed that it was a project that should be continuous around this and future years, as there will always be much more to do. GSU’s First Alternative Spring Break! 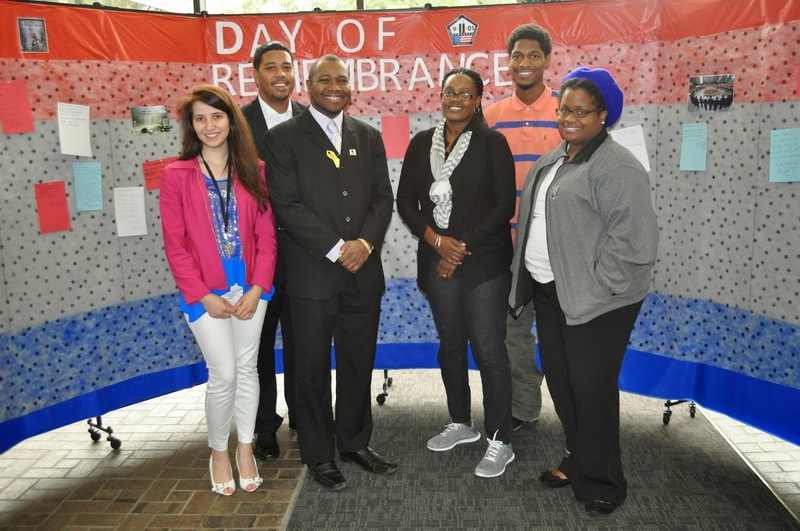 GSU recently wrapped up its very first Alternative Spring Break trip. 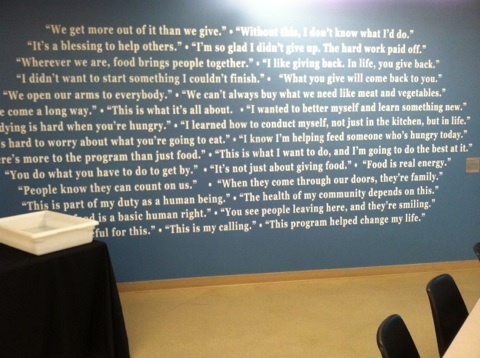 It was a pilot program designed to serve impoverished Chicago youth. It was also designed to determine the efficacy of creating future more expansive Alternative Spring Break programs. We are pleased to say, that as a result of the dedicated twenty students that accompanied us on this trip, it can be called a success on both fronts. The Alternative Spring Break trip began at GSU at 11:30 AM on March 19th, 2014 students packed themselves excitedly into the bus ready for whatever the day might hold for them. Students were treated to juice boxes, water bottles, gummy bears, peanut butter and jelly sandwiches and a whole mess of other snacks that had been loaded onto the bus for their enjoyment. 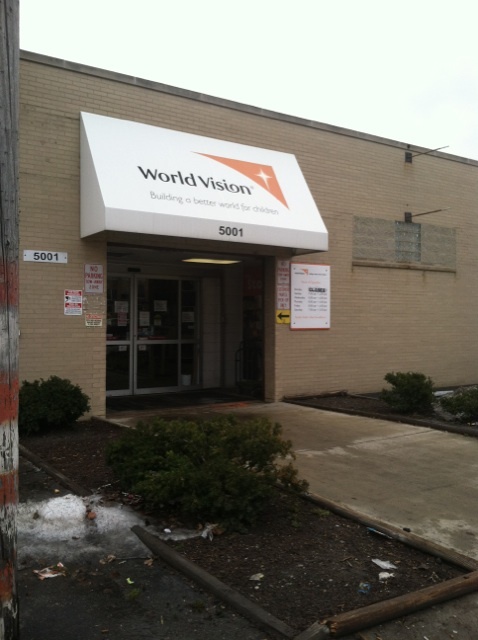 Our first stop was World Vision Chicago in the Austin neighborhood of Chicago. There we would serve from 1PM to 4PM. World Vision is one of the largest relief and development organizations in the world today. Our focus during this trip was assisting impoverished youth in neighborhoods in Chicago that do not often receive much relief or attention. WorldVision has a wonderful series of programs specifically related to children including the much lauded child sponsorship program. World Vision Chicago provides school supplies to teachers and students within the CPS network at little or no cost to them. 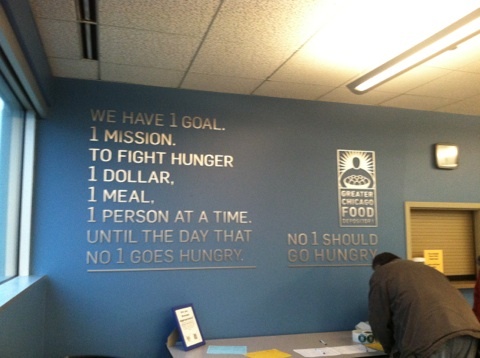 We spent our service there helping with this program specifically. We were divided into teams, one team tore down temporary shelves and helped to reorganize and resupply their teacher supply area. Teachers come to the warehouse where they are presented with numerous school supplies in an area that looks very similar to an OfficeMax or Staples, they can then stock up for the semester or year. Our other team worked on restocking WorldVision’s mobile unit. WorldVision takes this mobile unit directly to various schools across the CPS network where teachers and students can take numerous school supplies such as binders, notebooks, pencils, crayons, colored pencils, etc. After several hours of difficult work in the WorldVision warehouse we were all ready for a break. So, around 4:15 we hopped back on the bus and headed down the street to Austin’s famous MacArthur’s Soul Food Restaurant. There students were treated, courtesy of GSU to a full dinner buffet. We all were gratified with the skillful way the staff at MacArthur’s handled such a large group, and even had a separate area reserved for us. After some very delicious food, full and sleepy we got back on the bus and headed down south to visit the Greater Chicago Food Depository located in the Archer Heights neighborhood. 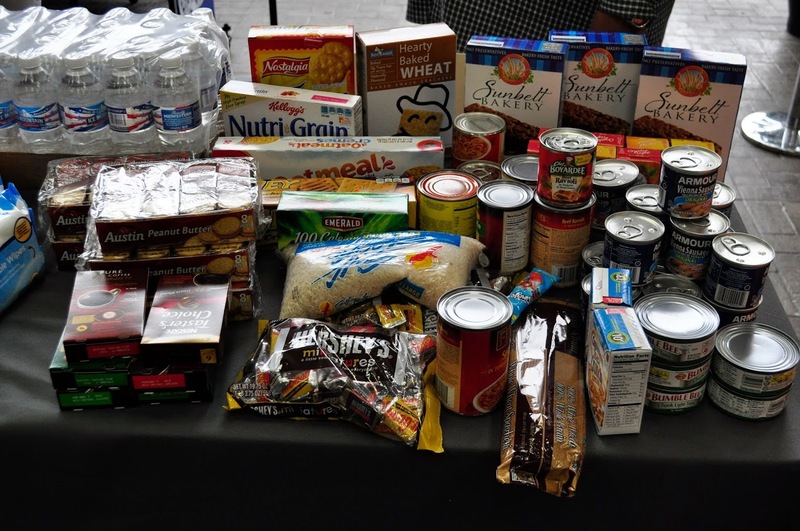 We started our service at the Greater Chicago Food Depository at 6 P.M. Several of our students were kind enough to bring several cans of food to this service site to donate before even beginning our service. 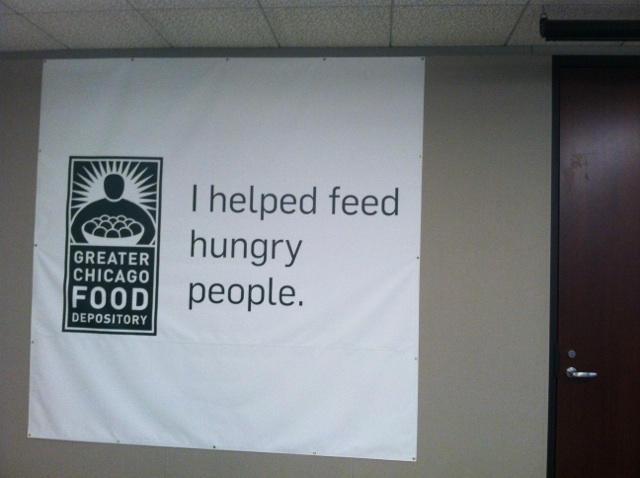 The Greater Chicago Food Depository is the Chicago’s largest Food Bank, providing food to a network of over 650 food pantries, soup kitchens, shelters, mobile programs, and children’s programs. The Food Depository receives their food items in incredibly large bulk quantities, it was up to volunteers like us to break down these bulk quantities and repackage the food for individual distribution. Governors State University’s Alternative Spring Break group was given the task of unloading several crates of bread, checking their expiration dates, assessing the quality of the bread, and then if they passed both levels of inspection boxing them up and sending them out to the various organizations within the Food Depository’s network. Over three hours of work our students managed to send over three hundred boxes of bread, totaling 5,000 pounds, to these organizations! At 9PM we headed back on the bus to GSU. We were tired from an extremely long day, but pleased with all the great service we had done. 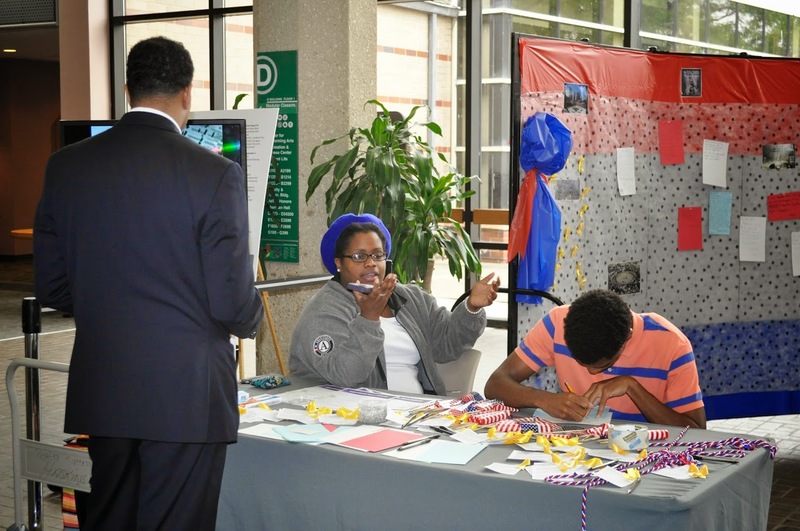 Our student volunteers came primarily from a Psychology and Social Work background, education was also well represented. 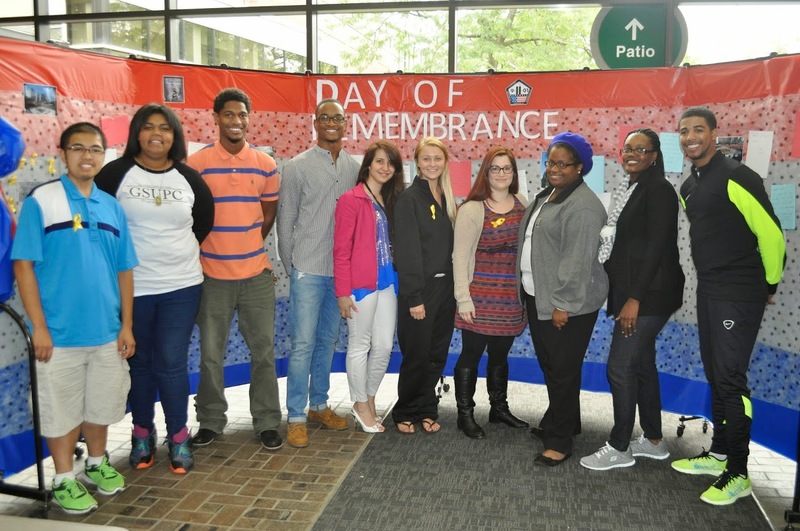 GSU’s First Alternative Spring Break Photo Gallery! We started our day at WorldVision Chicago. 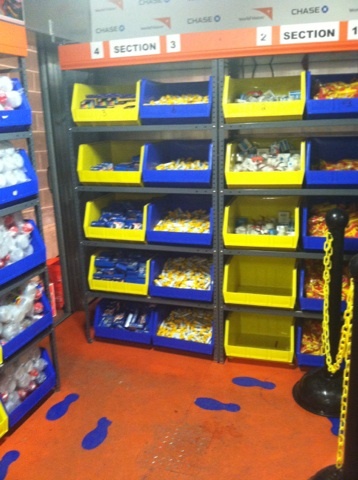 We would work at their warehouse helping to restock shelves full of school supplies! 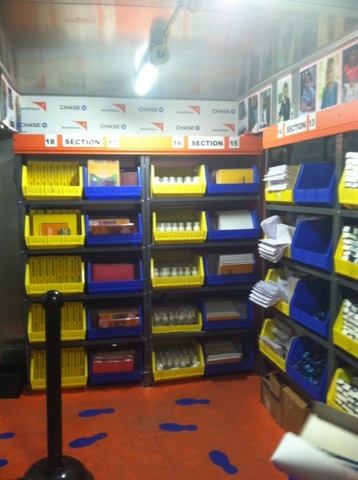 World Vision has a mobile school supply unit! They take this trailer to different Chicago Public Schools and give teachers and students a chance to snag cool school supplies. We managed to restock the entire trailer, as well as the actual warehouse unit! We headed down to the Greater Chicago Food Depository, the largest supplier of food to Shelters, Food Pantries, Soup Kitchens, and Churches in Chicagoland! Through our efforts at the Food Pantry, we managed to pack over 300 boxes and provide 5,000 pounds of bread to the over 650 organizations in the GCFD network! 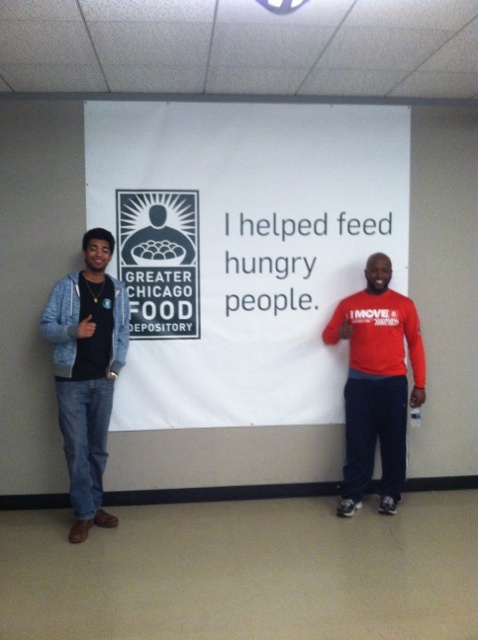 Meet Neel Rana and Dennis Dent, they helped organize GSU’s First Alternative Spring Break! CCE&CS Proudly Welcomes a New VISTA! The Governors State University Center for Civic Engagement and Community Service is proud to welcome it’s newest member, VISTA Rima Nimri. Rima joins us from Arab-American Family Services. We look forward to her time here and are excited for all the new programming and events Rima’s work will allow us to take on! “My name is Rima Nimri. I graduated with a major in Communications at UIC. I love life, like really love life for the many things it has to offer and the many experiences that it gives me which is why I tend to believe that I will be living long unless I get into a car accident. Stress is not in my dictionary, never experienced it unless I am driving. If you are ever riding with me, assume that it might be your last day to live. 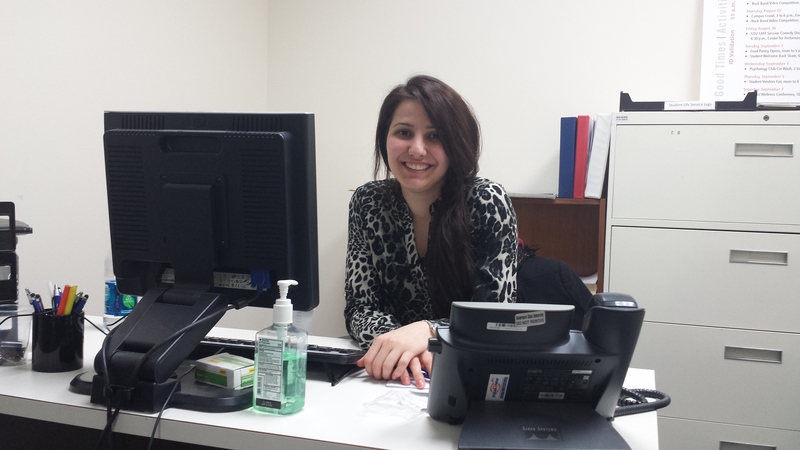 The Center for Civic Engagement and Community Service welcomes our new member Rima Nimri.